In my past, i was used to have a lot of selfie photos to take with the background of every interesting places that I had visited. I wasn’t taking a selfie just in order to have self confidence about my body or taking it in the front of mirror as it used to be happened with a lot of person nowaday. I was taking it with the reason to have a piece of my own trip history. By taking a selfie during that time, I have a strong proof that I had visited some itinerary places. Now, I begin to reduce that kind of pose. It’s been a lack of confidence to do such a thing and sometimes it’s better just take a photo without me inside the photo itself. So, for this week challenge, actually I got many photos in my collection that suitable for it. But, as this challenge is about the art of taking a photo, I have to select among them who has a different and unique style of taking a selfie. Here there are. First photo. This selfie photo shows a part of my face. I was taking a shot by myself and actually it was taken without any purpose. I was just doing for fun and curious wanted to know how the result if I was taking such a pose. After I checked the photo, I was surprised that this one not just showing an ordinary selfie. For me, I got the impression in my eyes having such a deep meaning. 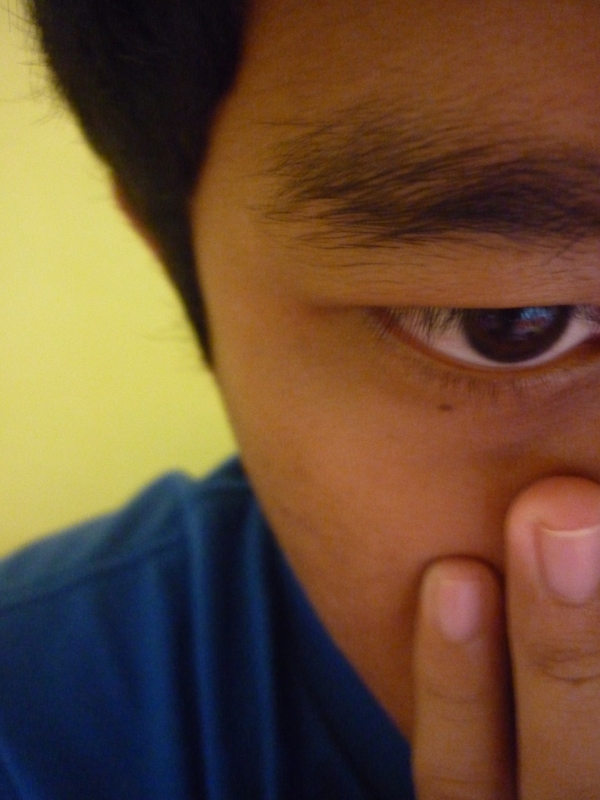 The expression from a half of my face shows a mysterious side, it is strong gaze, and the hand that covering my mouth seem to add the mysterious side for it. Second photo. During stay in some hotel a long time ago, I had another selfie photo. I was taking shot by arranging the camera timer so it can be automatically capturing my selfie photo. I liked so much the lighting during that time in my own hotel room. This kind of smooth golden lightning was eagerly made me want to have a background for a selfie on it. 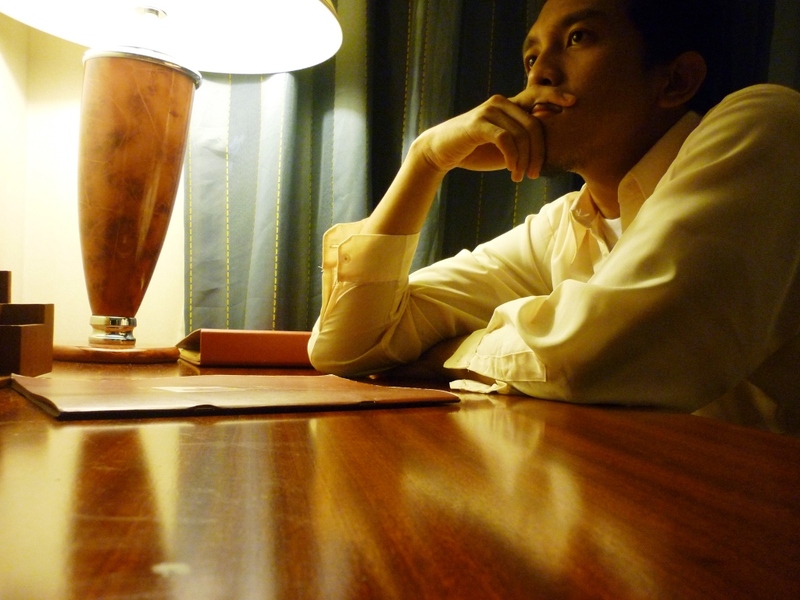 By posing like a person who is thinking a lot, I got the selfie shot and the result made me satisfy much. The combination between lighting of the background and the suitable pose made this selfie looked has a meaning that is different than usual selfie. Third photo. Both two previous photos are taken without a camera shown in the photos. It feels not so right selfie, isn’t it? Ahaha, but the substance is still about me, myself, and I. For me, it is still a selfie style as it taken by myself and just showing my own face or body. And, for the last one, it is the one which has the camera shown in the photo. 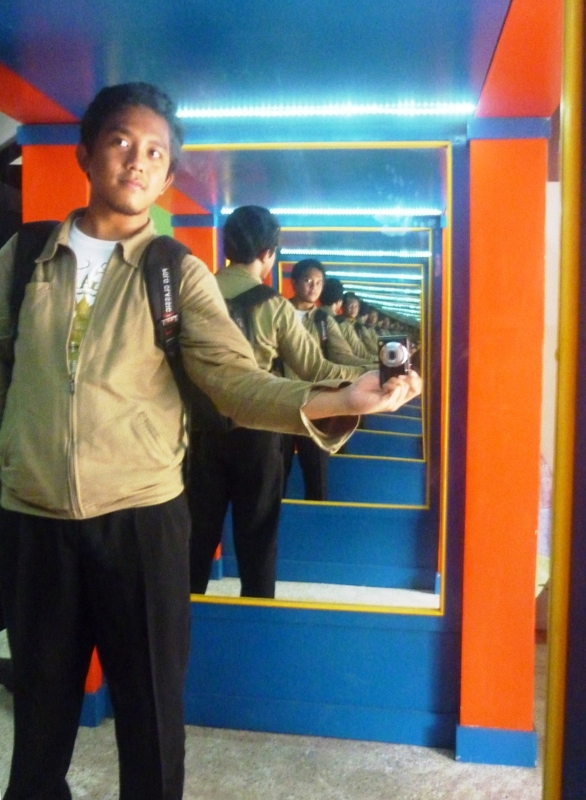 I was taking it in some of museum in Sawahlunto, West Sumatera. At there, I found two face-to-face mirrors that able to make a multiple reflection for everything who passing between the two of it. So, it made me want to have a shot for the reflection of those mirror that reflecting me and my camera. The result then shocked me much. The multiple reflection can be shot perfectly and it is looked like not just capturing me, but also myself, I, and a lot more of me there. That’s my entry. The first selfie shows just a part of my face. Then, the second one, I choose to shot a part of my body and the last one, I show up all of my body and also the multiple reflection of it. This week challenge has made me believe that every kind of selfie that I had taken is about just one thing obviously. It is about me, myself, and I. Only it. 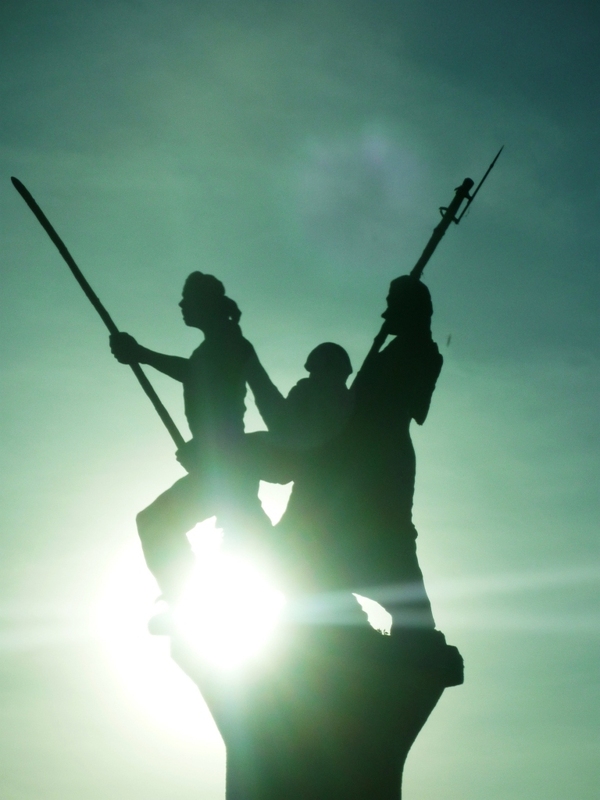 In Indonesia, there are many places that have monuments in the form of statue to commemorate the patriot of the nation. The statues are usually placed in the central of public place. This statues are built by capturing the expression of the struggle for freedom. We can get the strong impression of it and made us believed how it is hard to achieve the freedom during that time. And now, for this weekly photo challenge, I present the photos of the patriotic statues as the object of the photos that I have. Hope by this entry, we can get also commemorate the patriot of the nation and continuing their work to make a better nation to live. First photo. The object for the first photo is the statue of a runner who hold strongly and proudly a smolder torch. 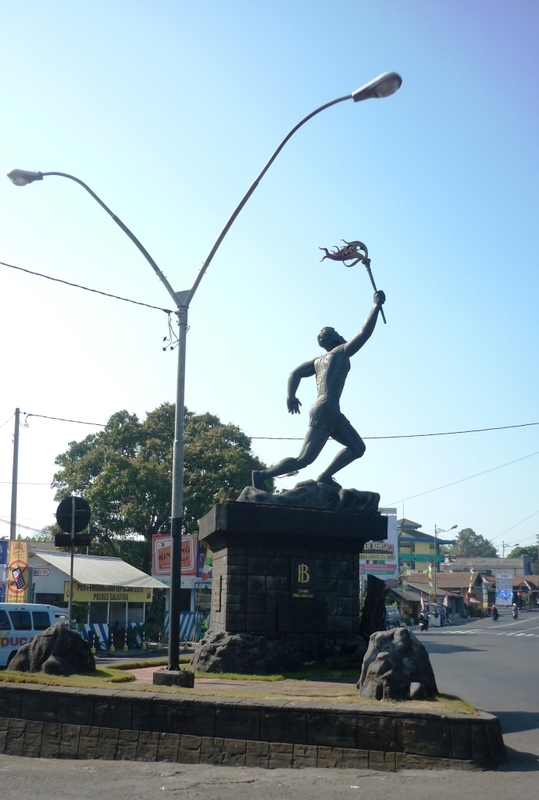 This statue located in the crossroad of Jenderal Sudirman street and Veteran street in Salatiga. The area where the statue is exist famously known as ABC area. I don’t know much about the history of this statue and the story behind it, but just to look at the statue, I get the impression of how great the spirit of the runner pictured in the statue. Second photo. The second photo is really describing much about the patriotic theme. The soldiers pictured in the statue are strongly impressing how bravely they got move in to the war field. They got ready with the weapon they had and proudly waving the nation flag to show their great spirit. That is the impression we can get from the object of the statue in Palagan Monument located in Ambarawa, Semarang Regency. 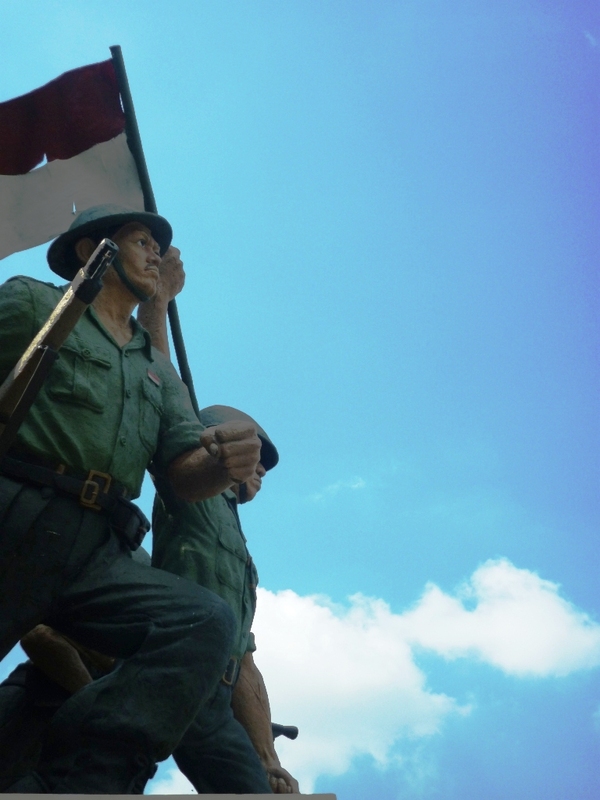 From the information that I know, the monument built to commemorate the history of The Five Days War that has happened in Palagan Ambarawa fighting the aggression of the Japan colonization at the year of 1945. Third photo. During my trip from Bukittingi, West Sumatera, I found a great moment to capture an object of the statue that located somewhere in Sicincin area, Pariaman Regency. That was the right time to shoot the statue when the sun was existed juxtaposing precisely with the statue. The statue itself is describing the struggle for the common people to fight with whatever weapon that they had. The sun position with its light really added the impression for the statue and it was great to see the combination of it. Okay, that’s my entry for the challenge. Actually there are still a lot of my collection that has the statue as the object of my photos. But, this three photos for me, I consider it as the best of mine. It always impress me much when I look at those statue. Their expression are really strong and made the person who look at it could feel the struggle for freedom that they showed. First photo. The sky is one of my favourite things to be captured. Its scenery is always unique and changing everytime. Especially during the evening when the sun is about to disappear. The clouds make a mixture of beautiful color and many forms they made. It is felt like a real painting in a very mega size, very abstract, and very astonishing everyone who look at it. Just like my first photo, all kind of that feeling can be happened just by seeing this. The sky in the photo gave the mixture of how white the clouds, how blue the sky, and by the edge of horizon , the evening golden color is existed. In contrast, I’ve shown a dark road in this photo just under the sky. Well, obviously from this photo, there is a juxtaposition between the sky that so much colorful and the earth that getting to be swallowed by the darkness of the night. Second photo. For the second photo, I tried to compare the sky and the earth by the side of a famous lake in West Sumatera, Danau Singkarak. The top of the photo shown how clouds gathering become a thick layer and the opposite of it, there was wide lake full of water. In the middle of it, you can see some mountains become border between of the two elements. All of nature’s elements are presented in here. Be it the water of the lake in the earth, the cloud of the sky, and the border of the mountains. All of it juxtaposed to the each other and made a great scenery. 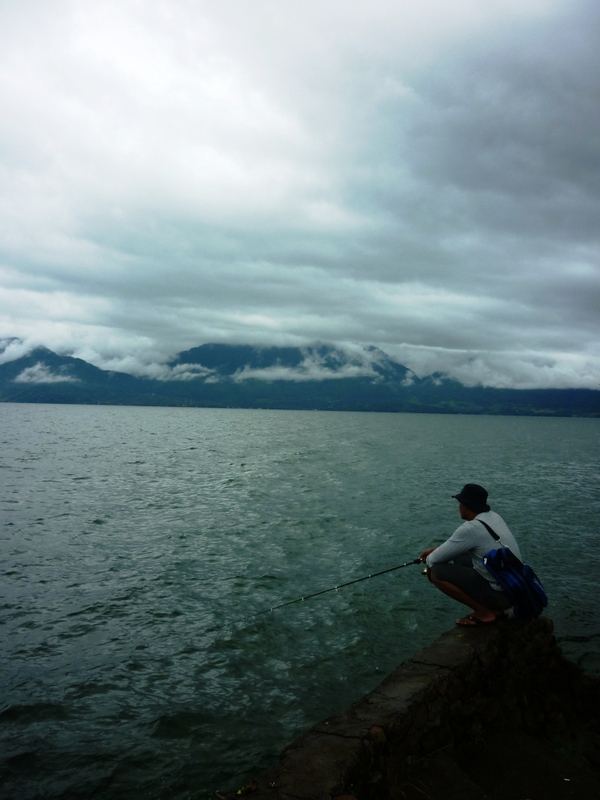 And the man who is fishing at the corner of this lake, I guessed he is absolutely enjoying this view. Third photo. Last, but not least. The other sunset photos that I’ve had. For me, this one is so amazing. 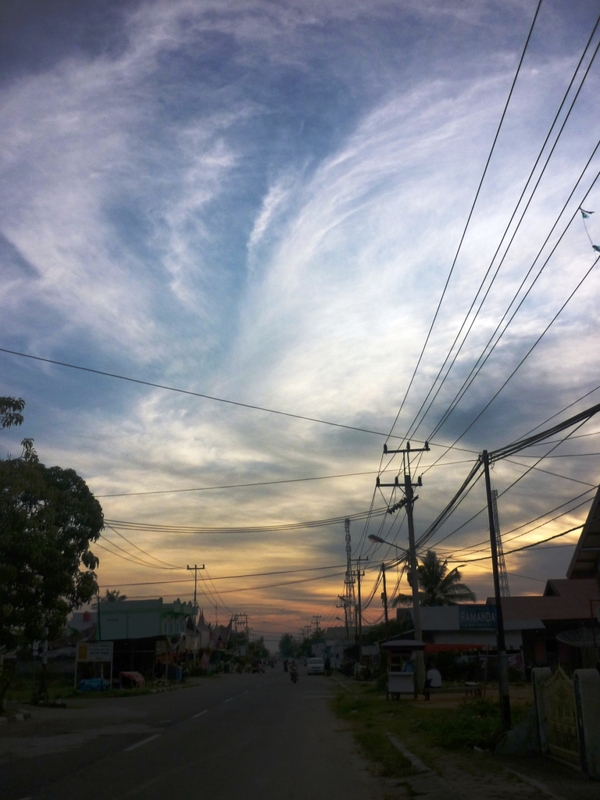 It is really describe about how the sky and the earth become juxtaposition to each other. 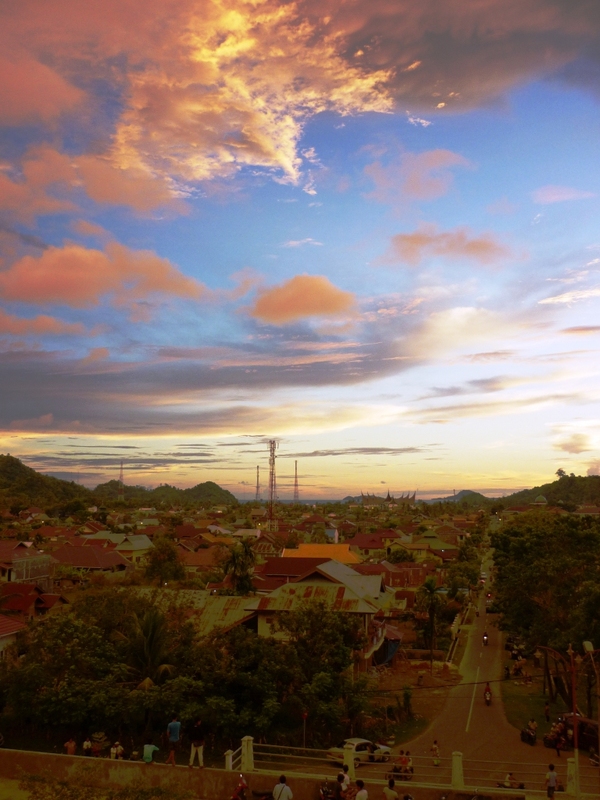 The sky with its colorful scenery and the earth that fulfilled with the populous block of the houses. From this photo, it can be concluded that the sky representing a very spacious place with its beautiful clouds and the earth representing a contrast situation where just a little space left to stay in. In the other conclusion, it can be interpreted that the one is God made that is so perfect (which is the sky) and the other is human made with its weakness (which is the situation in the earth nowaday). For your information, this scenery is located in a small city by the west coast of Sumatera, Painan, from the tsunami shelter in the city. That’s how the sky and the earth are juxtaposed to each other and makes a great scenery shown in my photos above. Each of it has its own interpretation for the elements. The two of it are really different , but by combining it together into one frame, really showing how great the nature is. There is just a straight line that dividing them become two different parts, which is the horizon line. And from it, we can conclude that there are something different side by side and it is separated only by a clear distinction among of it, just like the sky and the earth. What a theme for this week’s challenge. Family. The idea about family is something strong for me when it takes about capturing a photo from it. The photos that represent picturization of the family must have a deep impression about how close the relationship are being captured. It is family, a kind of very strongful bond that keeps up belonging to. So, this is gonna be hard task to have such photos that able to describe not just about the interaction among the member of a family, but beyond over it. It has to be capturing about how strong the family bond is. First photo. 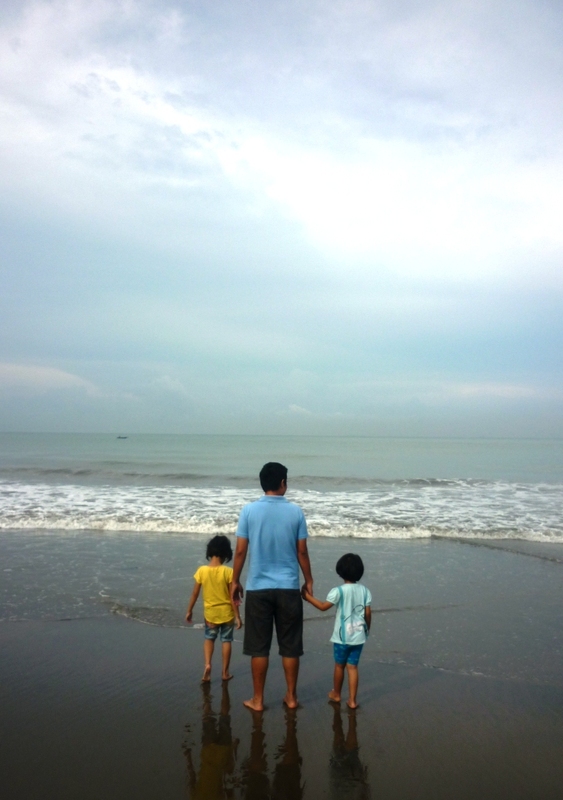 One day, when I was walking around at the Purus Beach in Padang, West Sumatera, I saw a father with his two little daughters. I didn’t know who they are, but to look how the way this man accompanying his daughters, made an strong impression for me. I could feel that the family bond were so strong between them. The man were holding the daughter’s hand and they seemed to be so enjoy with the beach scenery that they have. By having look onto this man and his family, my mind was wondering about how nice if I’ll be the father for my own daughters and having the beautiful scenery with them, just like this man has. Second photo. For the second, I take the photo of my own family. 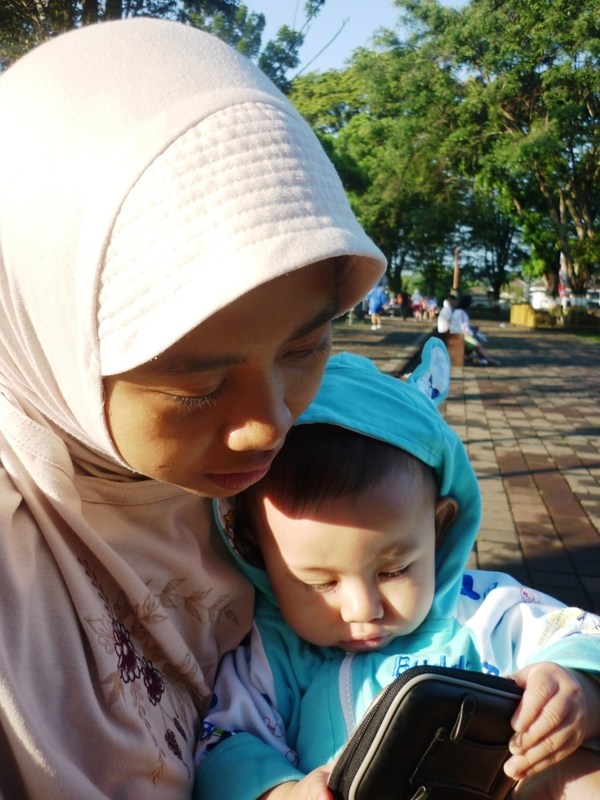 The object I’ve captured for this photo is my sister with his little sweet son. It was a photo that I considered as my best shoot ever. I was having a right moment, right expression, and right interaction that perfect to be shot. My funny nephew seemed to be curious about the thing that he hold and his mother was explaining about what the thing it is. This photo has a strong impression for me. My sister’s bond with his son was so nice to capture and just by looking this scene was made me feel how happy to be with our own family. Third photo. Last photo to submitt is a photo of my own hand holding on to my nephew’s little hand. 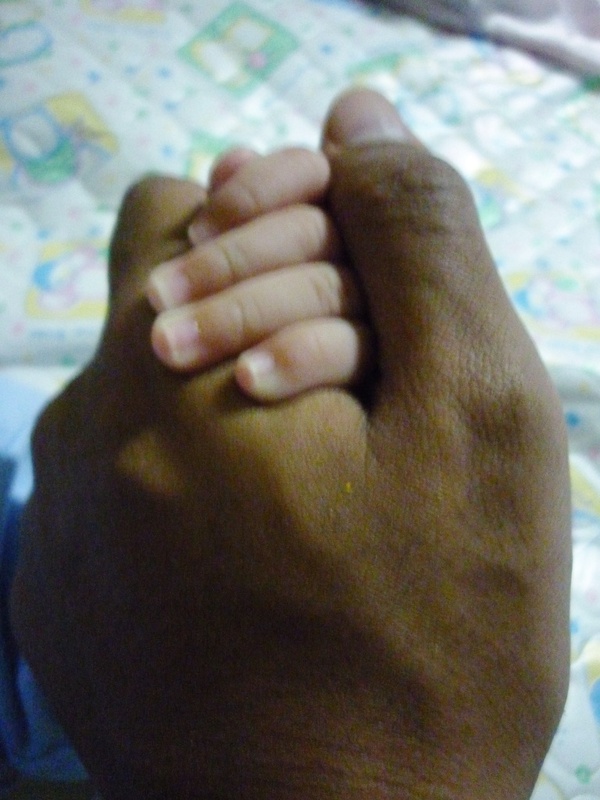 As an uncle for him, by holding his hand was made me feel how great the affection between us. I love him so much and wanna give a strongful bond of family for him. This holding hand is the best description to tell about the family bonding according to me. That was three photos about family that I have. For me, those photos are so meaningful and make a strong impression about the family bond. The photos remind us about the priceless treasure that we have in this world and nothing’s gonna replace it. The photos tell us about the people who is always take a care of us, surrounding and supporting for us in any circumstances . That is the family. First photo. It is taken from a hotel in Bandung, West Java, Indonesia. 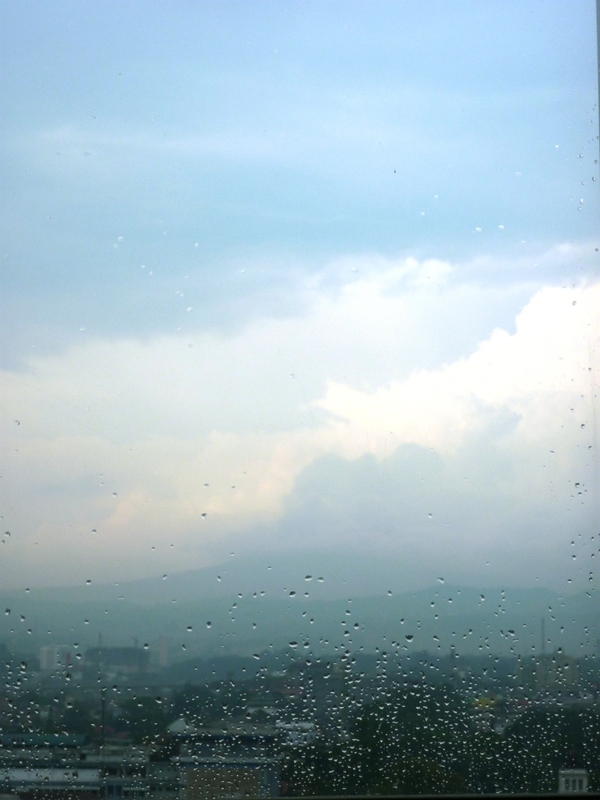 From the room that I’ve stayed, it was so clear to see Bandung city view. But, during the time when the rain was fallen, the scenery couldn’t be clear to see the outside of the room. 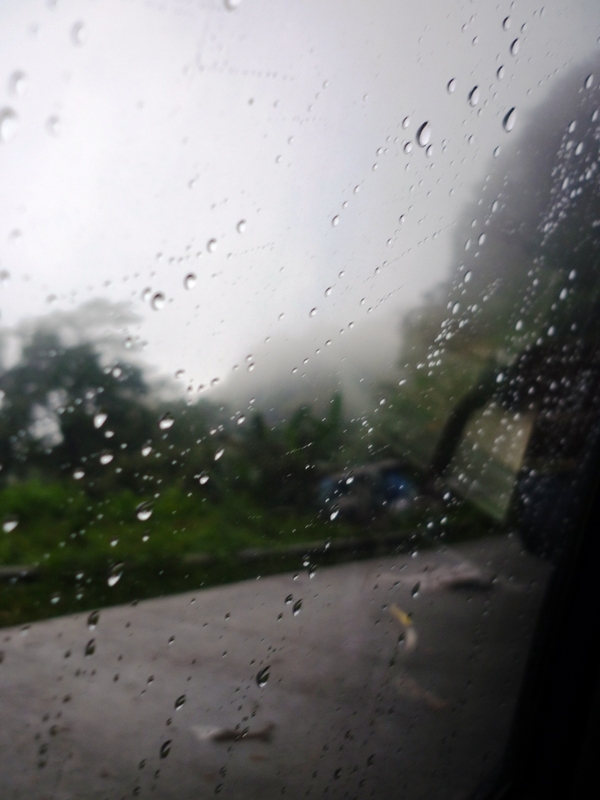 The raindrops stuck at the window and made a blurred view to see the outside there. This kind of phenomena looked so unique for me. Second photo. This boy, who sat in front of me during my trip going to Singkarak Lake, West Sumatera, by train, was so curious about the scenery that he could see outside the window from the train. Not just having a gaze onto the scenery he could look at, he was also talking so much to his family about anything that made him interested from the outside there. Window in the train made him can see how beautiful the view of his own homeland. And for me, who is just a visitor who wanna having a trip, actually having also the same expression that the boy has. The view outside there was so amazingly beautiful. Third photo. It is another photo about the raindrop that still left in the window. This photo was taken during my trip from Solok, West Sumatera. The rain had made the car that I ride being wet and some of the raindrops were stuck at the window. It was so a little bit difficult to capture this shoot because the car was moving so fast and the raindrops were spread away moving anywhere. But, by the time the car stopped for a while, the shoot could be done and the view outside the window felt so dramatic for me. Those are three photos best of mine that related to Window theme for this week. The window is a seeing through tools that help us so can see the view outside from our place. For me, to capture a view outside from the window is such an interesting to have. The raindrops or the glass reflection that happened in the window sometimes made the outside scenery become more dramatic and mysterious so it is curiously wanted to be revealed more what kind of actually this is for real. I don’t want to be late anymore to take the challenge after previous submission was almost late. It’s been quite hard for me to fulfil the previous challenge because there are just a few of my collection that suitable with the chosen theme. I almost gave up and wouldn’t submit anything for the last week, but thankfully the beauty flowers have helped me inspiring the appropriate task to have done with. For this week challenge, in the background, at first I found myself still hardly to think what kind of photos could match with this theme. But, after I read again the detail explanation of this challenge about how we must to focus the background for the photo instead of the main object itself, then the memory brings me into the travel that I’ve done in beautifully West Sumatera, Indonesia. Yes, “in the background” theme will be so perfect to be matched with my photos that I bring it up for this challenge. How come? Because when you have a travel to West Sumatera, you’ll see a lot of good scenery backgrounds to have a photo with. I personally believe that everyone who see such a scenery by their own sight, they will become so amazed and yap teased so much to make the scenery as the background of their photos, right? :D. I declare myself as one of the person that wouldn’t miss a chance to make them as my photo background because it’s really beautiful and as a mark for the travel that I’ve done, so there will be a obvious evidence that I’ve visited the place too :D.
First photo is the photo that taken in Maninjau lake, one of the large lake in West Sumatera. Look at how wide this lake and just a distance away from it, you can see the mountain stand surrounding this lake. It’s a combination of how nature brings us a good scenery for a background. In the middle of the lake, you can see somethings that floating in the surface. Those are the cages used by the fishermen to look after for the fish. In here, there are so many lake fishermen who work out to produce the fish products. 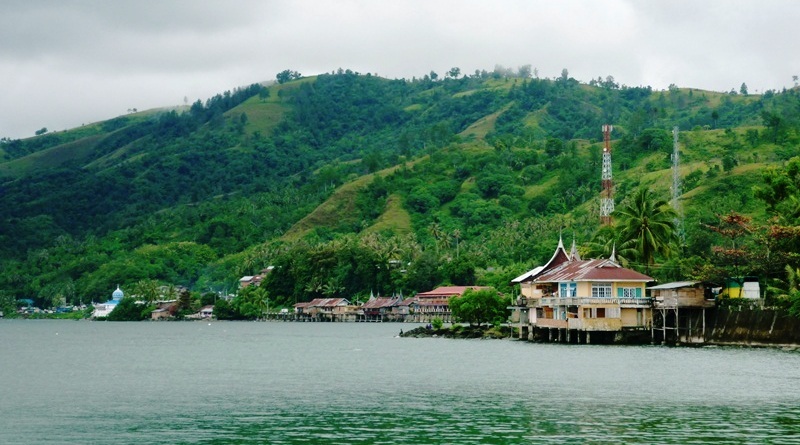 Second photo is about the panoramic view of another icon background in West Sumatera. It is Harau Valley located in Lima Puluh Koto Regency. Many people say that this kind of scenery called as the Green Canyon of Indonesia. Look how the wall of rock hills are showed off spreading in everywhere. Amazingly it’s not barren hills just like Grand Canyon of America, but it is still looking so greenly with the trees flourish on it. This green scenery is added more by the rice field (that is look green too) below those rock hills. Last but not least, I’ll show you another famous lake in West Sumatera, Singkarak lake. 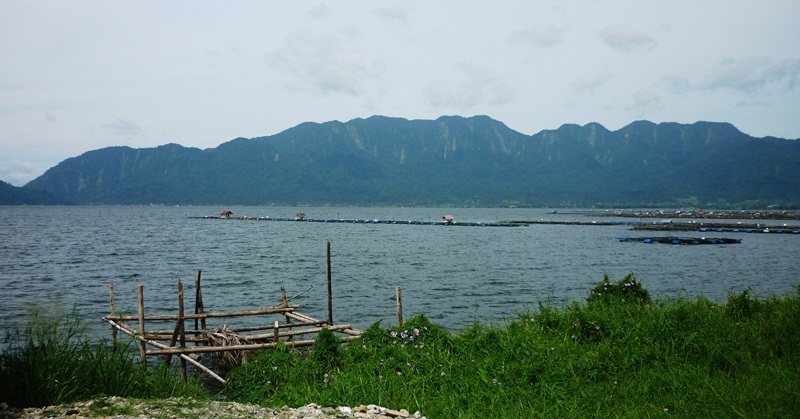 Look similar to Maninjau lake, the lake is also surrounded by the hills. The unique things from this photo, you can see the “Rumah Gadang” in the edge of the lake. Rumah Gadang is a building type that you can see everywhere in West Sumatera because it is one of the cultural things keep in here. Shame on me. It’s better late than nothing to do for this challenge. I just didn’t realized that the time quickly goes by until then the next Friday just a day to be happened tomorrow! How pity I am, for this week task, it seems not quite easy for me to look for it, but in this injury time of the deadline, the idea just popped out. It took a time for me to search the photos that match with this week challenge, which is “escape”. Talk about escape, that thing is generally determined by a description of the people are running away from something bothered them. This kind point of view firstly makes me difficult to find the photos suitable for it because the objects that I took the shots on it are often providing lack of human-centric interaction elements. Many of my collection are consisted of the nature scenery view based on my travel experience rather than the shot of the human-centric. Perhaps, this is one of my excuse that I’ve been late for submitt this challenge. Is it Ok, right? J. Then, later on, I’ve began to think differently. Why should I take the human-centric photos for this challenge instead of trying to find another objects (beside the human) to describe about the escape theme? Tada! The idea came. When I searched my own collection to find the suitable photos, I’ve found the non-human-object that is best described for this challenge. It is about the beauty of flowers trying to escape! The first photo gonna impress you much about the escape theme. 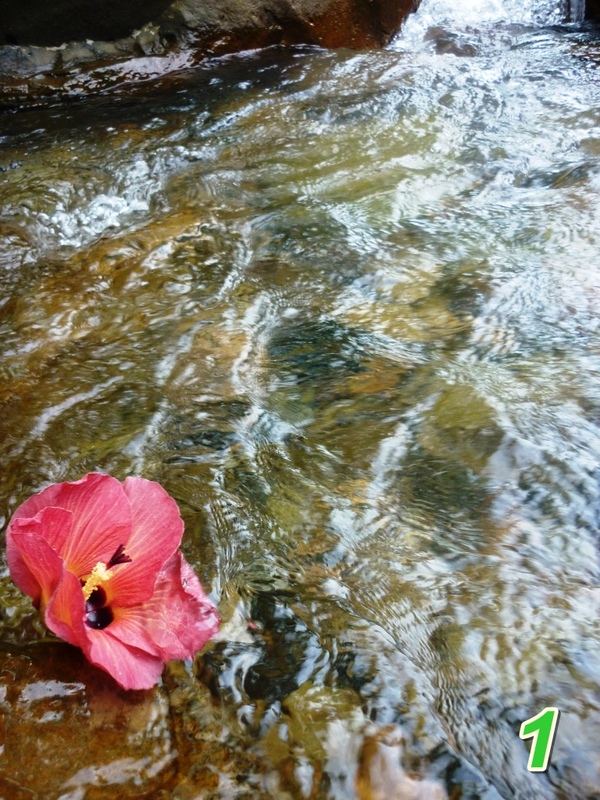 This lonely red flower is looked to have a decision by letting herself to the flow of the river. Yes, it is an escape journey that she has trying to say. The flower will go by the stream and enjoying her freedom from the branch of the trees where she lived before. 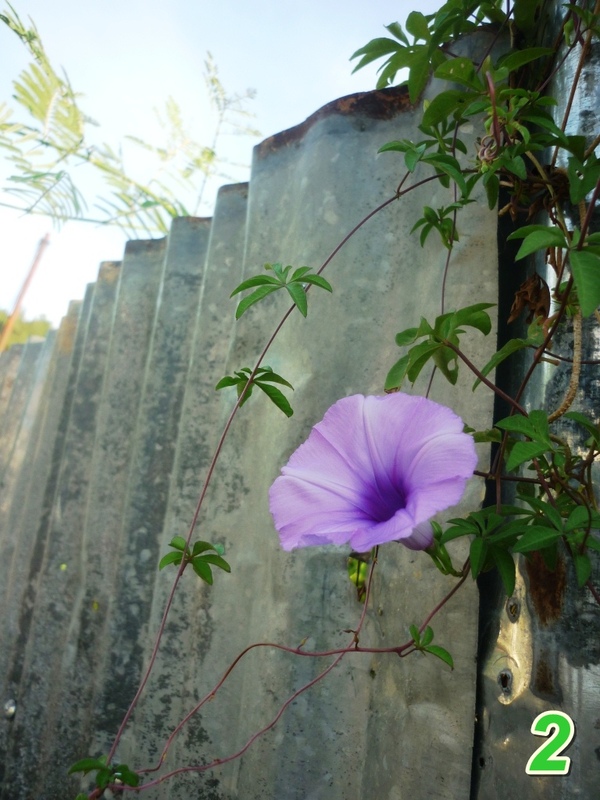 Coming to the second, this photo is describing about the effort for such a beauty flower to have escape from the zinc-made wall. It shows us that she has finally broken out the border that trying to make her trapped in the zinc-made wall. By the escape that she made, well, obviously she spreads her beauty with the color of the purple she has. Such a lovely touch of the escape theme.